Use a Thunderbolt 3 port on your Windows system to run resource demanding applications on two UHD 4K displays, or run a 5K monitor.This high-performance Thunderbolt 3 adapter lets you add two 4K 60Hz DisplayPort monitors to a computer through a single Thunderbolt 3 port, or it can be used to connect your Thunderbolt 3 port to a 5K 60Hz display using two DP cables.The Thunderbolt video adapter is compatible with computer systems that support Thunderbolt 3, such as models of Dell Precision and Dell XPS. Thunderbolt 3 is a protocol that uses the USB-C connector, but your computer system must support Thunderbolt 3 in order for the adapter to function as expected. If you connect the adapter to a USB-C port that does not support Thunderbolt 3, the adapter will not function.With an unprecedented 40Gbps of throughput, Thunderbolt 3 enables you to achieve the previously impossible feat of using a single port on your laptop to output dual 4K resolution at 60Hz to two independent displays. This performance enables you to run the most resource-demanding applications imaginable on two independent displays. You can output independent content to each display at resolutions of up to 4096 x 2160p @ 60Hz, which is perfect for editing 4K video or performing other Ultra HD tasks such as creating CAD drawings or reviewing medical imagery.For added versatility, the Thunderbolt 3 adapter can be used to connect two DisplayPort channels to a single 5K display. 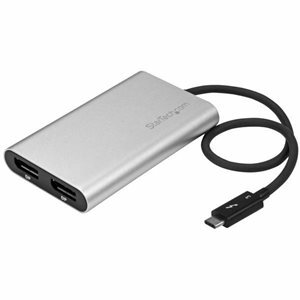 Using a Thunderbolt 3 adapter is the only way to connect a 5K display to computers that don't have multiple DP or Thunderbolt 3 ports, such as your Dell Precision 15 3000 Series workstation.Functioning as an external 2-port graphics adapter with audio support, this is a compact and convenient alternative to a laptop dock, when you don't need full docking capability.With two UHD 4K displays, you can work more efficiently from your laptop, so you can accomplish more in the same amount of time. Plus, with each display delivering 4K performance, you can have four times the screen space compared to 1080p. Creative professionals can be more productive with the freedom to edit 4K video on one display, while previewing raw video playback on the second 4K display. The TB32DP2 is backed by a 2-year StarTech.com warranty and free lifetime technical support. Some of the first computers to include Thunderbolt 3 require firmware and software updates before they will work properly with accessories like adapters and docking stations. To get the latest updates for a particular Thunderbolt enabled system, please check the Thunderbolt updates website for a list of system vendors with links to their respective support websites. While most Thunderbolt 3 PCs are full featured, a limited number of systems do not have some capabilities enabled in hardware, such as dual-monitor support through the Thunderbolt 3 port. This is because PC manufacturers can choose to implement some or all of Thunderbolt 3 capabilities, depending on their hardware design. For such systems, there is no way to enable all Thunderbolt 3 capabilities through software and firmware. You should check with the PC manufacturer to determine which features have been enabled in the Thunderbolt 3 port to ensure the best experience with Thunderbolt 3 products from StarTech.com. 2. Type Thunderbolt and click on the search result. 3. In the system tray, right-click the Thunderbolt icon. 4. Click Settings > Details.